No International Shipping: This option is selected by default. If this is chosen, you won’t see the other shipping options. Choosing either Calculated or Flat reveals your international shipping options. Will Ship Worldwide: The world is your oyster. But make sure that you can afford the time for the extra processing of customs forms. Will Ship to United States and the Following: If you’re comfortable shipping to certain countries but not to others, make your selections here; they show up on your auction page. When you indicate that you will ship internationally, your auction shows up on the international eBay sites, which is a fantastic way to attract new buyers! eBay has lots of good international users, so you may want to consider selling your items around the world. If you do, be sure to clearly state in the description all extra shipping costs and customs charges. Traditionally, the buyer pays for shipping, and this is the point at which you must decide how much to charge. You also have to calculate how much this item will cost you to ship. If it’s a small item (weighing under a pound or so), you may decide to charge a flat rate to all buyers. To charge a flat rate, select the Flat option from the drop-down list in the shipping section of the Create Your Listing page and fill in the shipping amount. Before you fill in the amount, be sure to include your costs for packing and how much the insurance charges will be. Buyers prefer a flat rate when making purchases. If your item weighs 2 pounds or more, you may want to use eBay’s versatile shipping calculator — select the Calculated option from the drop-down list. Because UPS and the U.S. 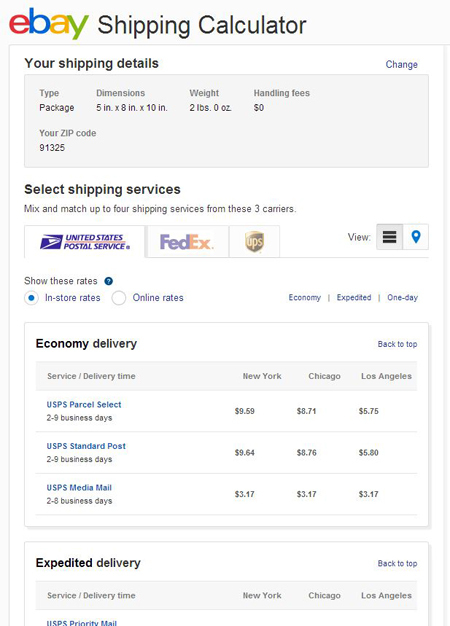 Postal Service now charge variable rates for packages of the same weight, based on distance, using the calculator simplifies things for your customers (and you). Be sure you’ve weighed the item and know how much your handling charge will be. The calculator allows you to input a handling amount and adds it to the overall shipping total but does not break out the amount separately for the customer. The calculator also conveniently calculates the proper insurance amount for the item. The correct shipping amount is automatically posted on the buyer’s view of your listing, based on his or her registered ZIP code. You need to enter the package’s dimensions and weight to get a proper estimate. You also need to select which delivery services you want to offer to buyers. To select more than one, click the Offer Additional Service link and another drop-down menu appears. The calculator automatically appears on the item page so that prospective buyers can type in their zip code and immediately know how much shipping will be to their location.